The Iditarod, Alaska’s best-known sporting event, is the focus of this fabulous Alaska winter tour. Meet four-time Iditarod Champion Martin Buser at his kennels—a special experience arranged by us—and visit the Iditarod Headquarters, where you’ll see photos, videos, and mementos of the Iditarod race. Another out-of-the-ordinary adventure included by us is dinner and Iditarod festivities at the Musher’s Banquet, where you’ll see the musher’s draw for starting position in the race and perhaps meet them for photos and autographs. Witness the ceremonial start of the race in Anchorage and the official restart of the race in Willow, where you can cheer on your favorite mushers as they head off into Alaska’s wilderness on this 1,049-mile journey to the finish line in Nome. You’ll also spend time in Anchorage and at the luxurious Hotel Alyeska, located in the ski resort community of Girdwood. Here, you can enjoy a variety of activities, including skiing, snowshoeing, taking an included aerial tram ride for breathtaking views, or simply relaxing at the hotel’s spa. For a chance to see grizzly and black bears, moose, and caribou up close, you’ll visit the Alaska Wildlife Conservation Center. At the Alaska Sealife Center, get an in-depth look above and below Alaska’s waters. If you desire to see the Iditarod, this Alaska winter tour is an adventure not to missed. Welcome to Anchorage, nicknamed the “City of Lights.” Spend time relaxing today and getting to know this fascinating city at your leisure. This morning, meet your Tour Director and traveling companions at a welcome breakfast. Then, board your motorcoach and make one of the world’s great drives as you travel along spectacularly scenic Turnagain Arm. 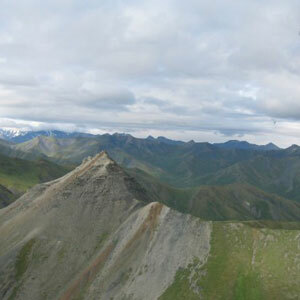 Marvel at the dramatic views, and keep your eyes open for Dall sheep, eagles, and other wildlife. Take a break at the ALASKA WILDLIFE CONSERVATION CENTER for the chance to see grizzly and black bears, moose, musk ox, caribou, lynx, and even a porcupine up close. In coastal Seward, visit the ALASKA SEALIFE CENTER for an in-depth look above and below the waters of Alaska. Arrive in the ski resort community of Girdwood, where you’ll spend the next two nights at the luxurious Hotel Alyeska. Enjoy a full day at leisure—perfect for joining in a wide variety of optional activities. Consider dogsledding, flightseeing, skiing, snowshoeing, or you may choose to just relax at the hotel’s spa. An included aerial TRAM ride offers breathtaking panoramas of Turnagain Arm and seven glaciers. Return to Anchorage and join an included tour through the historic downtown district and to Lake Hood, the world’s busiest seaplane base. Next, visit the ALASKA ZOO for a behind-the-scenes tour. This afternoon, there is time to explore Anchorage on your own. You may want to visit the Anchorage Museum. Tonight, enjoy Iditarod festivities and dinner at the MUSHER’S BANQUET. Enjoy Alaska entertainment, see the mushers draw for starting positions, and have the opportunity to meet them for photos and autographs. Travel north to Big Lake and visit the home of four-time Iditarod Champion Martin Buser at his HAPPY TRAILS KENNELS. Hear his fascinating personal stories, including how his sons are named after Iditarod checkpoints, while viewing the grandeur Alaska has to offer along the Iditarod Trail. Then, visit IDITAROD HEADQUARTERS to view pictures, videos, and other mementos of the Last Great Race. This evening is at leisure back in Anchorage. Maybe shop for souvenirs, try some fresh seafood, or sample a locally made brew. This morning, head to 4th Avenue to get a great spot for the ceremonial start of the IDITAROD. Before the race starts, there’s a chance for photos and autographs with some of the mushers. 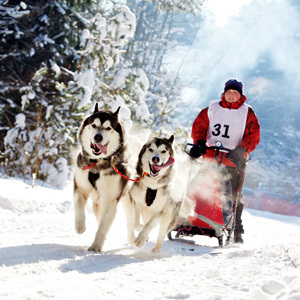 Spend time cheering on mushers from all over the world, and enjoy other Iditarod festivities. Later, visit the ALASKA NATIVE HERITAGE CENTER, which shares the rich heritage of Alaska’s 11 indigenous cultural groups. Tonight, reminisce over your Alaska winter adventure at a farewell dinner. Travel north today to the quaint community of Willow, which started as a mining camp when gold was discovered in 1897. Here, you’ll view the official RESTART of the Iditarod. Cheer your favorite musher as they head off into the Alaska wilderness on this 1,049-mile journey to Nome and the finish line. Be sure to have your camera ready for this once-in-a-lifetime experience. Your tour ends this morning with guests departing on independent schedules. 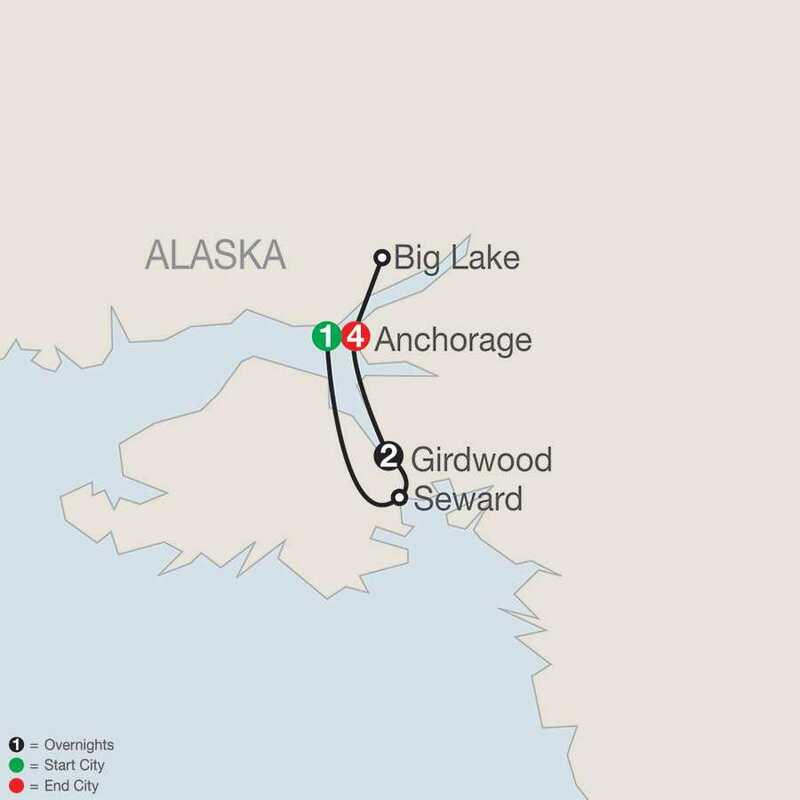 Transfers are provided to Ted Stevens Anchorage International Airport. This full service, luxury hotel is situated downtown near businesses, museums & historic buildings. The hotel features one restaurant (open breakfast, lunch & dinner), a full service fitness center, indoor pool, gift shop and more. Complimentary wi-fi is available in the lobby and public areas. Nestled in a lush valley surrounded by mountain peaks, hanging glaciers and water views, The Hotel Alyeska offers guests convenient access into the Alaskan wilderness. The hotel is situated on the Turnagain Arm only 40 miles from Anchorage International Airport. The hotel features an indoor pool, hot tub, health club, jogging trails, gift shops, business center, concierge service, restaurant, café, and sushi bar.